While you can't turn art into a formula, the film industry has managed to come stupidly close. While many storytelling principles still stand across mediums, successfully crafting a compelling, immersive narrative in virtual reality requires a brand new rulebook. 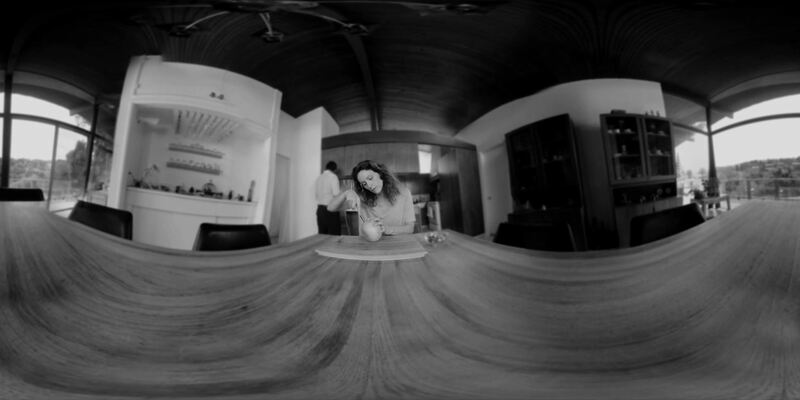 Through trial, error, and success, writer/director/editor Adam Cosco figured out the right rules to follow (and break) in "KNIVES"—his latest 360-degree short film. 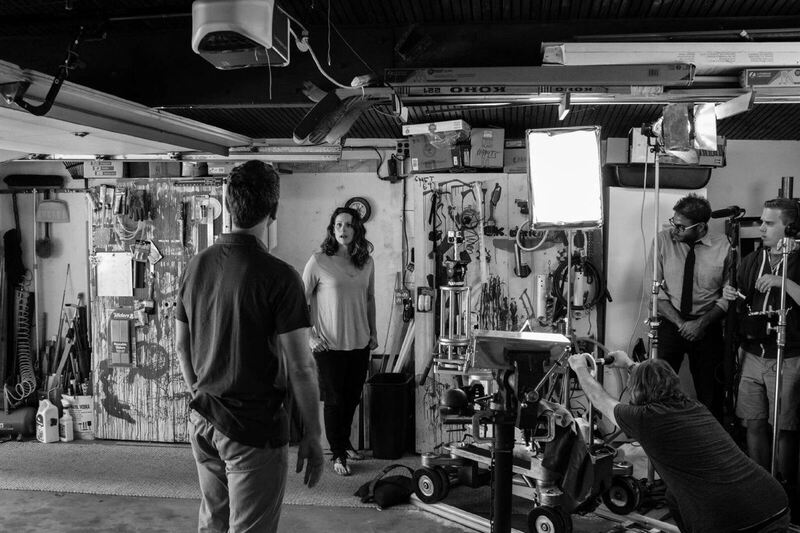 The film tells an old-fashioned tale of a woman, Kelsey Frye, struggling with the realization of her husband's infidelity, and Cosco represents the timelessness of the story in black and white. But the story transplants itself into the future when a door-to-door salesmen offers Kelsey a way out—one that may rip a hole in the space-time continuum. The film plays with the concept of different realities, and is a compelling story in and of itself, but we interviewed Cosco and learned it wasn't initially meant for virtual reality. He told us he originally wrote the script as a traditional film, but left the initial drafts in a desk drawer for many months because it felt wrong on a standard, flat screen. 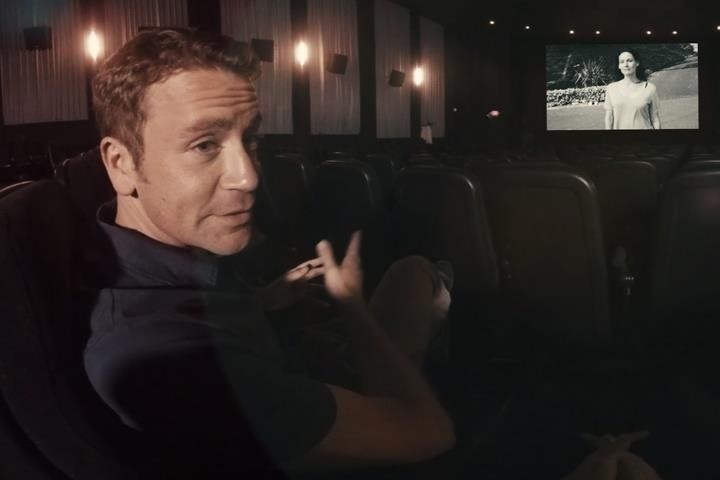 When he learned about the filmmaking possibilities in virtual reality, and made a few shorts to learn the emerging technology, he realized that KNIVES was meant to be watched from every angle in a headset, not necessarily in a dark theater. But 360-degree virtual reality video poses several new and different challenges when compared to traditional filmmaking. In addition to the tiny, unforgiving technical details that can vastly change a viewer's experience, simple jump cuts in editing can feel jarring and you need to find new tricks to direct the viewer's eye where you want it. Even then, when someone has the freedom to look, you can't guarantee the location of their gaze. Cosco explained his process to us and discovered that he could create movement in one shot that leads the viewer to his intended location after the next cut. By directing actors to move to a specific area, our eyes will naturally follow them. When something changes, we naturally follow it. Aside from our inherent curiosity, it's rooted in a survival instinct. When that eye-luring motion stops at a certain point and a cut shows us a new shot, the obvious location for what a director wants us to see lies in that exact same place. While looking around may seem like an act of free will, in KNIVES, you can rest assured that Cosco is intelligently pulling your gaze exactly where it belongs. KNIVES is about change. They always say true change comes from within, and it's, like, sometimes we spend years wrestling with something. For some reason, we don't know why we're unhappy. Maybe it's because we drink, maybe it's because we're in an unhealthy relationship, or maybe it's because we hate some aspect of ourselves. Then something funny happens: we wake up one day and we make a silent promise to ourselves. We say 'I'll never be that person again.' And then, the culmination of years of unhappiness suddenly goes away. But another funny thing happens: we look back on our former self and we kind of pity them. The thought of being that person makes us sick to our stomach. Because the process of growing is building on our past mistakes, it's almost like a gag reflex that ensures we learn a lesson. We learn that drinking makes us unhappy, or that living our lives in service of someone else's happiness is a dead-end road. We learn from the pain of our mistakes and then we grow. You can only touch the iron so many times before you realize it hurts to get burnt. Making a compelling, immersive film designed for virtual reality isn't just about technical aptitude. It's not just about knowing which camera to pick up to get the shot you want—and, if KNIVES knows best, you need several. (Cosco told us he utilized the 360 Designs Mini EYE 4, iZugars Z4X, and the Ricoh THETA—though it wouldn't surprise me if there were others we neglected to discuss.) Technical details definitely matter, but true immersion requires emotional impact. Cosco has figured out how to tell a story that targets your basic, instinctual emotions. Furthermore, KNIVES is better understood through the context of its medium because of the frequently voyeuristic composition of its shots and tangentially-related subject matter. That's likely why it's performing well at festivals (like FIVARS, Kaleidoscope's Summer Showcase, and VRTO, to name a few), and it was nominated for a Proto Award. Most 360-degree videos, for all their merits, feel somewhat transplanted into this new technology. Conversely, KNIVES feels like it belongs in virtual reality. Someday, we may learn a partial formula to this sort of filmmaking, but it's far more compelling in the early stages when a talented director intuitively bridges the right elements of both science and art. KNIVES is currently running through various festivals, but will be available to watch at home in the near future. We'll let you know the details as soon as they're available. Cool! I want to watch it so much!